More than a Wall: Personal Account of an Immersion Trip to the U.S.-Mexico Border | The Gettysburgian. When deciding to apply for the El Paso, Texas/Mexico Immersion Project with the Center for Public Service, I thought it would be a great learning opportunity. Although I am a Political Science major and actively immerse myself in current events, I still felt ill-informed about current immigration policy and wanted a hands-on experience to truly comprehend what was happening at our nation’s border. The experience not only exceeded my expectations, but opened my eyes to the roller coaster of emotions, frustrations, and triumphs that exist in the Borderland. In preparation for the trip, our group leader, Christina Noto, and our group mentor, Bridget Schell, gathered together with the trip’s nine other members in several meetings prior to our departure in January. During this time, my peers and I diligently explored the Borderland’s history as well as levels of oppression on the area’s people, and facets of cultural sensitivity. Upon our arrival in El Paso, we met our tour guide, Kari, and began the transition from passively absorbing information to actively observing Kari’s non-profit organization. The organization, tagged as the Border Servant Corps, works closely with refugees and their families who have been recently released from detention centers. I anticipated that the stories we would hear from families within the Border Servant Corps would be difficult to hear, but no level of preparation or hands-on observation could have readied me for the emotion that their stories evoked and the intense inspiration I gathered from their hardships. Our group heard a variety of stories– from families with mixed statuses to students who were unfairly affected by the de-funding of DACA. We heard fathers proclaim their determination to give their children a better education and mothers who had risked it all to give their daughters the best medical care possible. Other refugees had lost their families for a variety of reasons, ranging from the difficulty of distance and time to gang violence. We connected with the families immediately, their stories infiltrating our hearts on the spot. We will forever cherish the moments we saw them smile after all their went through. Listening intently to their stories, their hardships, their strength and their wisdom, I was humbled and eternally grateful for all that life had given me. The absolute determination and selflessness of those sharing their stories was an inspirational experience that surely none of the group members, myself included, will ever forget. In addition to personal stories of refugees, our group heard from a federal judge in El Paso whose case load is predominantly immigration related and works as an immigration lawyer. We also spoke with a woman who donates children’s books in Spanish and Indigenous languages to the Border Servant Corps, due to the multitude of languages their refugees speak. The stories we heard from those who shared were educational and at times, extremely frustrating. Learning about the many faults of the immigration system and all that needs to be done to fix it felt overwhelming. We would have given anything to reform the laws, to help refugees through an already daunting process and ensure their safety in crossing into the Borderland. Especially after spending time with recently released refugees who had been in detention centers. The children had a fearless, free spirit and their parents had only kind words of gratitude for the people working at the Border Servant Corps. Becoming close with these families and then watching them walk out the doors to a rocky, unknown future was one of the most difficult parts of the trip. Borderland. A word and place I had never of heard before. It seems so disconnected and distant from snowy southern Pennsylvania, a state with what appears to have minimal connection to our nation’s border. However, the reality is the complete opposite. Many Americans know very little about what is actually happening in the Borderland–and most only associate the area with an image of the impending wall. However, it is immensely important to understand that the border is more than a wall or a chain-link fence. This trip demonstrated to our group that borders are social constructions, man-made and only existent on a map. This area is not just a line drawn in the sand between the U.S. and “the other.” Immigrants are not criminals; they are here to create a better future for themselves and their families, similar to all of our ancestors. “The borderlands are filled with vibrant communities, resilient people, and unforgettable stories that transcend unnecessary divisions,” described Kiera Koch ‘19, a participant on the immersion project. 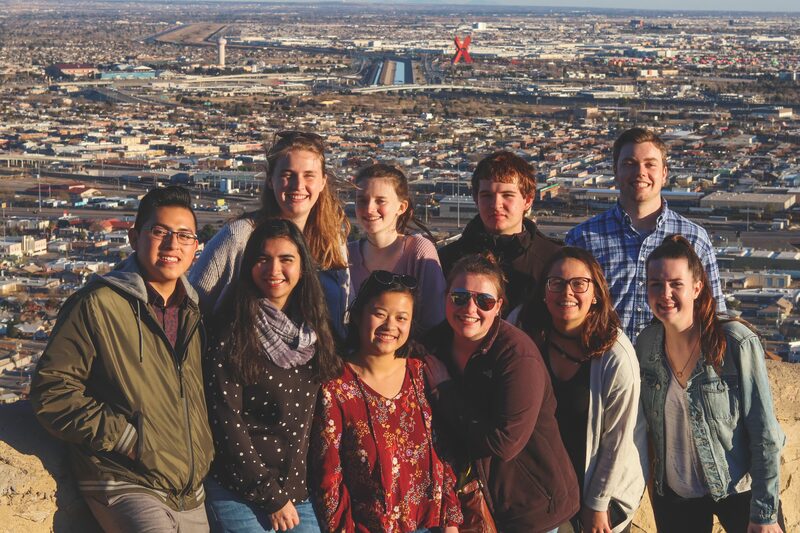 Like Koch, members of our immersion trip came home, with a new knowledge of the Borderland and the overwhelming desire to educate our fellow students in honor of those whose stories we heard and who continue to go voiceless each day. All of the group members urge students, faculty, and community members to look beyond social media and the news. Only by traveling to the Borderland will one be able to have a true and authentic firsthand experience. Writer’s Note: Angely Arriaza ‘22 and Kyra Pfeiffer ‘21 contributed to the making of this article.